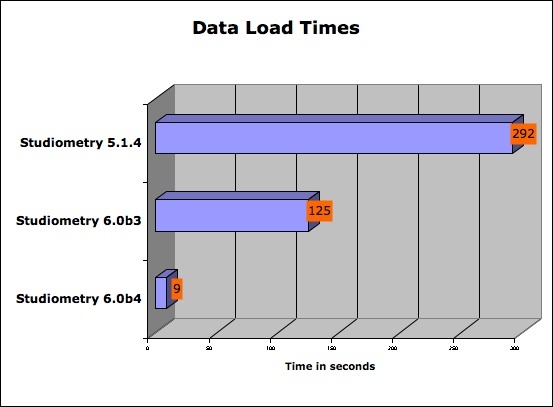 Studiometry 6 Beta Update: Even Faster Load Times! The file, which took 4 minutes and 52 seconds to load in 5.x (and 2 minutes and 5 seconds to load in the last beta) will now take only 9 seconds to load completely. Add the fact that modifications are saved instantly, effectively removing the 5.x save time, and you have a blazing fast Studiometry even with huge data files! The first beta is expected to be available early next week, with regular updates being announced via the Beta Mailing list. You will receive instructions on how to download and use the beta each time a new update is release. The new version of Studiometry will contain many great enhancements and feature additions. We’ve spent a lot of time focusing on improving saving and loading time for users with large amounts of data. A completely overhauled data format, where common items such as Debt/Credits and Projects are stored in a local SQL database as opposed to an XML file, produces incredible performance results. Load times will be significantly faster after a one-time process of converting your data to the new format. In testing we have seen Studiometry 6 take as little as 40-50% of the time Studiometry 5.x took to load the same data. The best part of the new data format, however, isn’t the improved load times. With the new SQL database behind Studiometry, all changes made to the common data items (projects, clients, debt/credits, etc) are saved IMMEDIATELY to file. This removes the need for periodic data saves, which previously could take upwards of 10 minutes in the background for users with tens of thousands of items in Studiometry. This also removes the need for Studiometry to save all data when quitting, which produces a reduction in quit and save times from several minutes to less than 5 seconds in nearly all cases. The new data format still maintains the flexibility of the previous format where all data is stored locally on every machine and can be accessed without a connection to the server. It’s the best of both worlds with an SQL database mixed with the previous XML data file format. In addition to the revamped data format and performance, Studiometry 6 will contain over 75 new features, updates, and enhancements. Other notable new features include Data Rows for Visual Invoice templates, allowing you to create a template-within-a-template for displaying items such as Debt/Credits. Data rows are vertically a flexible space that will stretch based on the information shown for each item, giving unsurpassed flexibility in creating your custom templates. Additions to the Report features allow you now to select specific items for each report, either manually or via Item Sets such as Paid, Unpaid, Estimated, Un-Invoiced, Billable, Purchase Order, and more. These new features give Studiometry the ability to create itemized estimates and purchase orders based on entered information. Other features include a completely overhauled interface, one-click invoice and report generation, additional keyboard functionality, updated Time Sheet entry window, and many others. More information about these and other new features will become available soon via our website and blog. Keep checking back for sneak peaks and beta status updates. Studiometry 5.1.4 fixes a few small issues related to templates, invoices, and Windows specific issues. This is a recommended update for all registered 5.x users. Please visit the version history for the full list of changes included in this update. Also don’t forget that anyone purchasing Studiometry 5.x will now receive a free upgrade to Studiometry 6.0 when it is released later this summer! Studiometry 6 will be released later this summer, and with it will come many new features and additions to the already robust application. Oranged Software regularly offers free upgrades to users who purchase Studiometry just before pay-for upgrades are released, and we are continuing this tradition with the release of Studiometry 6. Any new single user, add-on, or site license purchased on or after July 7th will be eligible for a free upgrade to Studiometry 6.